Forgiveness opens the gateway to inner peace. Always. Ever so often, people hurt us. With their words or actions or both. We end up hating the presence of such people in our lives and are seething with anger at their mere mention. While such a response may appear logical and justified, in reality, it does affect the quality of our own lives. We end up carrying the baggage of that past experience and grieve every single time we reflect upon it. Anything that we carry as a burden will hurt us. Try this exercise: take a full glass of water and hold it up with your arm extended fully. Keep holding. How long is it since your arm starts aching and your shoulder starts hurting? How long can you go on holding this glass of water this way? At some point, you will be compelled to set it down. The sense of ‘aha’, the relief, you will experience when you put down that glass is the same when you forgive someone for what she or he has done to you. Forgiveness, however, must be unconditional. That’s when your inner peace will also be total. I had the opportunity recently to deal with someone who has caused enormous pain and hardship to me. I hurted badly each time this person’s machinations got the better of me. Then, after much resisting, suffering and learning, when I realized there was no point in laboring over getting this person to see reason, I chose to simply forgive. I did not judge. I did not see who was right and who was wrong in the bargain. I simply chose to let go of all my hatred and ill-will for this person. For a long, long time, there was no contact between us. But because of the choice I had made, I discovered that I was not hurting anymore. That there was no anger in me towards this person anymore. When we finally were to meet recently, I was apprehensive how I would respond. I was hoping all the pain of the past will not surface again. I need not have been so concerned. Because when we met, while I discovered that this person had not changed one bit, my inner peace was untouched. My forgiving this person had helped me immensely. 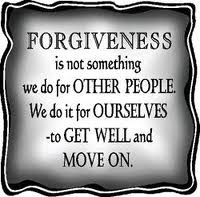 A key ingredient of forgiveness, I have learnt, is to be non-judgmental. To say you are forgiving someone because she or he has done something wrong is bringing judgment into play. Such forgiving is suppressing your real emotions – your anger, your hurt, your pain. When you are not alert, these emotions can come back and explode on the surface like a volcano. True forgiveness is when you don’t judge, when you let go of your anger, your hurt and your ego. You simply decide that irrespective of what this person did to you, you are simply moving on. Because you don’t want to analyze. You don’t want to dissect what has happened. You simply want freedom from the past. And to be free of whatever you are holding on to or whatever is holding you in its clutches, you have to first let go. Then the forgiveness is complete. And liberating.